Optical Windows are often used to create a physical barrier between two different environments – preventing two gases from mixing together, separating liquids from the air, keeping a sealed system in a vacuum. In many optical systems, a window is used to protect more expensive optical components (within an assembly) from back-splatter, out-gassing or other possible damage. While it can take nearly any form, most windows are either round or rectangular in shape. All windows are fabricated from an optically transparent material, with two flat (or plano) polished surfaces. 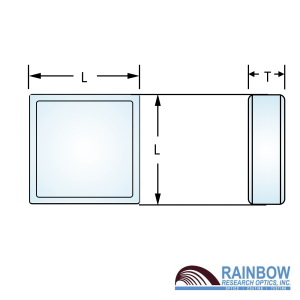 From prototype to production, Rainbow Research Optics, Inc. (RROI) manufactures and delivers precision grade and commercial quality windows to address applications in the ultraviolet (UV), visible, and infrared (IR) wavelength ranges. Plane Windows – Wedge < 3 min. Wedge: < 3 arc min. Parallel Windows – Wedge < 10 sec. Wedge: < 10 arc min. Interferometer Flats – Wedge 30 ± 5 min. Wedge: 30 ± 5 arc min. Wedge: 30 ± 6 arc min.